My clock radio didn’t know what time it was this morning. The reason was because of Daylight Savings Time. Wait a minute, you might be saying. Doesn’t Daylight Savings Time end next weekend? That is correct. It is now observed in most of the United States before the first Sunday in November. And that is where the problem arose. A few years ago, my clock radio died. The new one I bought had some great features my old one lacked. First of all, if there is a loss of power, when electricity is restored, the time resets. The second feature had been excellent, but now it is a problem. The clock is programmed to automatically reset itself according to the start and end of Daylight Savings Time. However, I bought the clock in 2006. The program chip has the dates for the old method of starting and ending Daylight Savings Time. For one year, the feature was a blessing. But then the starting and ending dates were changed. Had I bought a clock without this feature, I would have to keep track of those two dates manually. But now, I have to keep track of four dates: when it starts, when it would have started, when it would have ended and when it actually ends. I’m twice as inconvenienced than I would have been had I bought a clock without this feature. There is a workaround. Had I remembered that the clock was going to set the time back an hour last night, I could have changed the clock to the Atlantic Time Zone. But I forgot, so I suddenly was very rushed getting for church this morning, having an hour less time than I thought I had. Next Saturday night before going to bed, I need to set the clock back on Eastern Time. Otherwise, I might be an hour early to church. Unlike jumps in time because of Daylight Savings, time and most things in life generally happen in linear fashion. We progress grade by grade in school. Careers progress through a series of promotions. Temperatures rise and fall one degree at a time. These are but a few examples, and for much of our life, whether our daily schedule or our life story, we simplify our lives with the assumption that most things work this way. I have been fascinated when things don’t work that way. Sometimes, it is a matter of a boundary condition. Other times, it is a quantum jump from one state to the next. I became interested in such phenomenon at an early age. The first examples I remember had to do with the street on which I was born. My side of the street was considered to be Richmond Hill with a corresponding post office. The other side of the street was called Ozone Park, and had a different post office. And one summer day, the boundary was highlighted by nature. A weather system was positioned for a few minutes such that it was sunny on the Ozone Park side, while our side was getting a summer shower. This type of situation increased my interest in geography. Instead of a gradual transition, when you cross a body of water or even a line drawn on a map, you might go from one state to another or one country to another. Within Turkey, on one side of the Bosphorus is Europe and the other side is Asia. Play twister on the right spot where Arizona, New Mexico, Colorado and Utah come together, you could have one limb in each state. Not far from there, if you pour some water directly over the Continental Divide, some of the water will end up in the Atlantic Ocean and the rest will end up in the Pacific. But then you have anomalies. For example in part of Wyoming, the Continental Divide splits into two lines, defining the Great Divide Basin. If I pour out my water there, it can’t flow into either ocean. It either stays in the ground or evaporates back into the air. In the boundaries between countries, I have seen maps that include disputed boundaries, countries separated by a strip of “no man’s land” rather than a line, and imprecise boundaries on older maps before the lands were actually explored. As time passed, I began to notice that different classifications of people could occur in one person. Over thirty years ago, for less than a year, I was married to a person of mixed race. One of her parents was a Caucasian from Northern Europe while the other parent was mostly Black with some American Indian added to the mix. Is she white because the plurality of race in her is white and she has blue eyes? Is she black because she grew up in a black neighborhood, her skin tone is the color of café au lait and her facial features are closer to those typical of a black person (although in some poses, she more closely resembles someone of her father’s nationality)? Does she have the right to decide what race she is, or is it imposed on her by law or society? To add another twist to the scenario, she has a son from a previous marriage. (She and I had no children together. I don’t know if I could have produced children.) His father was also from a Caucasian, Northern European ancestry. Her son has no Black features at all. She raised him to think of himself as white, to match his appearance. She did not subscribe to the “one drop of black blood” theory of racial identity. And yet depending on year and location, he might have been classified as white, black, free to decide for himself, or possibly even American Indian. The first divide I was aware of in my own life was not gender. It was ancestry. My father is German and my mother is Hungarian. The disparity between the two is further complicated by the fact that the Hungarian people resulted from a melting pot of Central Europe and include influences from Huns (of mysterious origin, but likely Asiatic), Uralic tribes (some of whom migrated to Finland and Estonia), Tartars and Turks, Bulgars, Serbo-Croatians, Slavs, Romanians (why gypsies are associated with Hungarians), Slovaks and even Germans. When my mother’s parents entered the United States through Ellis Island at the beginning of the 20th century, their country was part of the Austro-Hungarian Empire. Even so, my parents demonstrated some of the personality traits of their respective ancestries. My parents did not compete with each other to steer me or my brother towards their way of doing things in areas where those ways were different. While my parents are of a generation that embraced ethnic stereotypes to simplify their view of life, they also embraced the idea of the American melting pot taking the best of each culture and creating a stronger whole than found in the rest of the world. And they valued the concept of American individualism. They would have seen themselves and their children as individuals with individual personalities that they influenced but didn’t instill. My mother as the primary homemaker and caregiver would have been especially aware of differences in personality between my brother and me from the time we were babies. She knew we were not born as “blank slates”. Both were proud of their heritage and its various examples in music, food, dance and so on. But they could also enjoy each other’s to a certain extent: my mom being more willing to accommodate my dad’s tastes than the other way around. They were proud most of all to be Americans, and saw themselves as Americans of a particular background, not German-Americans or Hungarian-Americans. There is something that annoyed me when I was growing up, and it annoys me when I see it being done to this day. That is when an adult thinks it is fun to tease a child in a way that puts that child on the spot when that child is not capable of handling that situation. In this regard, I remember when an adult other than one of my parents would ask me whether I was German or Hungarian. Sure, put me in a situation where no matter which I choose, it will probably upset one of my parents! Depending upon my mood or perhaps who I felt closer to at the moment, I answered differently over the years until such questions no longer were directed to me (ironically just about the time I would have been better able to handle them). Afterwards, I would be upset over appearing to choose between them in this way. What I can tell you is that I always felt closer to my mother. She was my primary role model. Yes, I can see traits I inherited or adopted from my dad, but many more from my mom (while my brother inherited or adopted more from my dad). I could look at my mom, and even if she wasn’t saying a word I could tell what she was thinking. But if I was looking at my dad (and he didn’t say much anyway), I had no idea what he was thinking. In fact, if there was one area where I disappointed my dad (who was generally proud of me), it was my talkativeness. He called me “Silent Cal” (in his ironic manner) and I’m sure he was pleased when I became more taciturn as I got older. (My mom called him a “closed-mouthed German sometimes in frustration.) Little did either of them know that my reticence was due to the shell I had formed to keep people from seeing my gender secret. But with my mom, I could have animated discussions and even disagree with her as long as I respected the fact that she was my mother. She once shared with me that it upset my brother to hear us go at it sometimes. But when the discussion ended, usually there were no hard feelings and we went on to the next part of our day. As I got older, she also would tell people that she would rather work in the kitchen with me than anyone else. I loved watching my mom prepare food. Soon I began to pick up her techniques, learn her rhythms, acquire her habits and skills. I started to anticipate when she would need a spoon or a measuring cup. I knew when to move out of the way so she could move to the stove or work area. Most of the time our conversation was about anything but what we were preparing, but we operated as a team. Some of my warmest memories are of the times we made Christmas cookies, yeast cakes, salads for the invited guests to our backyard picnics, or holiday dinners. All these things helped me be more aware of my gender identity and its disparity with the body in which I was housed. Your core identity, including gender identity, comes from your mind, not your shell. The same is true for me. As I feared, the Dodgers had an early exit from this year’s playoffs. So no more sports posts are expected for a while. And now on to the latest post. Green Acres lasted for six seasons on television and introduced the characters of Oliver Wendell Douglas (played by Eddie Albert) and Lisa Douglas (played by Eva Gabor). At the beginning of the show, the couple live in New York City. He is a high-powered lawyer who dreams of a more idyllic life as a farmer. His socialite wife reluctantly goes with him when he buys a farm. Oliver buys a farm sight unseen. Unfortunately for the Douglases, he had fallen into the clutches of Mr. Haney (played by Pat Buttram), a con man’s con man. The rundown farmhouse, nutrient-depleted soil and a host of other decrepit gadgets and swindle attempts, collectively serve as part of the running gags the propelled this show into a surrealistic realm of satire not seen on other rural-oriented CBS fare. So far, nothing in my description sounds remotely related to a transgender theme. While Lisa always appears very glamourous (except for one scene during the opening), her wardrobe and unassuming comedic activities are not of a type normally copied by drag performers. So where am I going with this? Approaching my two year anniversary of living full-time as a woman, I have made a number of observations on how cisgender people react to the sight of me, as well as their reactions to other transwomen (both observed and reported). At one point along the way, it occurred to me that there is an analogy between some of those reactions and a recurring element of the show. First, a discussion of the reactions and what they are based upon. Another transwoman recently remarked to me that no one is 100% female, including cisgender women. And that is absolutely correct. Look at just about any woman and somewhere there is a trait or mannerism that is more on the masculine side than the feminine side. Consider some examples of famous women: Diane Keaton readily acknowledges her very masculine gait. Marlo Thomas possesses a deep voice and Cher’s vocal range was deeper than Sonny’s. Some women, like tennis star Martina Navratilova are on the more muscular side. Basketball star and model, Lisa Leslie stands 6’5” and was able to dunk a basketball by the time she was a sophomore in high school. Even if we rule out those women (bodybuilders and athletes who rely on strength for superior performance) who masculinize themselves though steroids, HGH and so on, we can think of women who have more masculine facial features, some facial hair, a bit of an Adam’s apple, broader shoulders, flatter chests and so on. 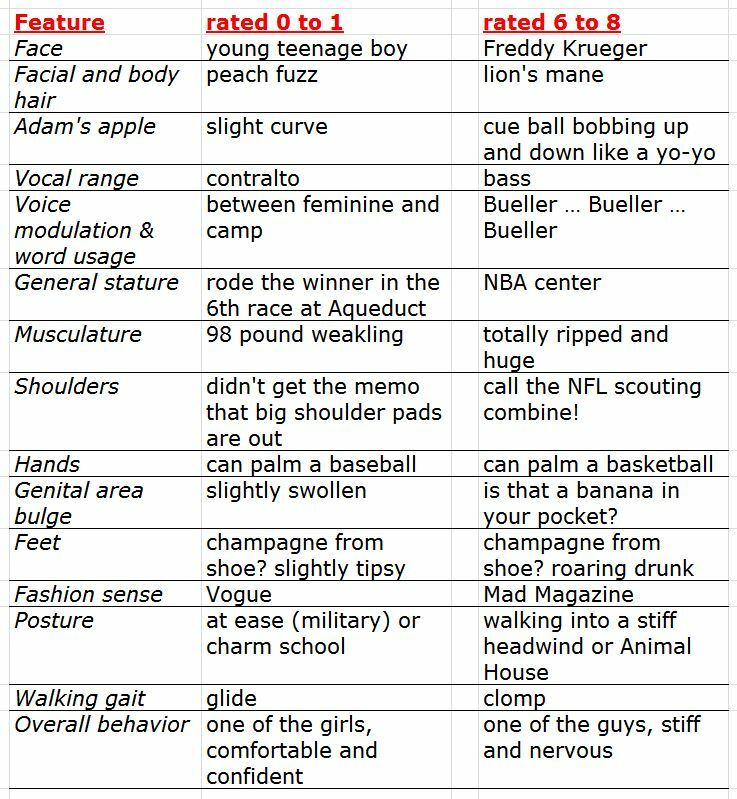 So why is it that almost all women with these masculine attributes are not mistaken for men (despite some insensitive name calling from cruder individuals in a few cases)? Why is it that I and some other transwomen I know or have seen pictures of are very successful in blending in with the general female population while others struggle to be recognized as female and face periodic harassment as a result? And I came up with the Green Acres analogy as an explanation. One of the features of the ramshackle farm house was that the electricity for the kitchen was supplied by a generator that was inadequate for the needs of a household with a combination of modern appliances such as television, refrigerator, washing machine, toaster, and so on. If too many were running at the same time, the generator would overload and stop running. So Oliver figured out a simple system based on the wattage of each item in the home that ran on electricity. He assigned them numbers from one to six. If appliances that totaled more than seven were plugged in, the generator would blow. Here is the link to watching the episode that introduces the subject (Season 1, Episode 9). The link will take you to the free side of Hulu. So what’s the analogy? Let’s take a scenario that transwomen face from time to time if they are out and about in the world: going into a women’s bathroom at the mall. And let’s say this mall is fairly busy, so there will be a number of other women coming and going during our visit there. To various degrees each woman will be subtly engaged in what is routine for them: observing the other women who are passing through. It is not an exercise in voyeurism. The observation will be discreet, not intruding on the privacy or space of the other women. But most of the women will observe nonetheless. There are a number of reasons. One never knows when they might see someone they know, or see another woman wearing an article of clothing or hairstyle to be admired (whether the admiration is shared or not), or will smile at the timeless event of a mother coming in with a young daughter (or if young enough, her son). The latter reminds us of a second reason: women are trained to be mindful of their surroundings and have heard the stories of what happens at times if a woman becomes careless. The vulnerability of us women is heightened in a restroom, especially if suddenly it is no longer busy. A mother bringing in her three-year old son who needs help with his toilet is not a concern. As that boy starts approaching manhood, the concern level goes from zero to sixty in a hurry. If a casual glance reveals that there are only women present, the observation remains discreet. But if the particular appearance of another person starts to raise the “wattage” readings on a subconscious meter, the level of scrutiny will increase. The only difference is that it is impossible to set hard and fast numbers the way that Oliver was able to calculate for the kitchen appliances. First of all, each woman has her own meter calibration. Furthermore, any suspicious feature could range from borderline to extremely obvious. Therefore, any feature could be given a value anywhere from one to eight. The following chart is a somewhat light-hearted guide to the range of comportment within the MTF transgender community. I gave much consideration to find terms that would not be offensive. Hopefully I attained that objective. Now if you are an MTF transgender and one or more of your attributes threaten to blow the whistle on you, all hope is not lost. In most of the areas of concern, things can be done to correct, camouflage or compensate for the problem areas. Remember that cisgender women are beautiful, but most enhance their beauty by using techniques to deal with their problem areas. One of the reasons for makeup and fashion is to help a woman look even better. We can learn these techniques, too. Some of us learn them so well and even improve on them, to such an extent that sometimes cisgender women get tips from what we do to look great. If there is one area that is recognized as the biggest giveaway of a male past, it is voice. Adjusting the pitch of the human voice is not all that difficult, and there are many good tutorials out there. The average male voice is only one octave lower than the average female voice. Speaking and singing ranges for men and women overlap. And yet, so many of us MTF’s either don’t care, are afraid to try or gave up too soon. While it is true that estrogen will not raise the voice, practice will. Voice control is muscle control. Like any other muscles, as throat muscles are used, they respond. Learn which muscles will raise your voice, and then practice what you learned. The more you speak in the higher range, the more those muscles will develop with a corresponding weakening of the muscles used in the lower range. I am starting to lose my ability to hit lower notes that I could have reached easily a couple of years ago. I have conversations with a trans sister who has been full-time a few years longer than me. For some time now, she is no longer able to sound male. But there is also more to voice than pitch. Cher had a deeper voice than Sonny, yet they used speech patterns that left no doubt that Cher was the woman and Sonny the man. Women have far more modulation with their voices and often end their sentences on an up note, while men tend to speak more monotone and end their sentences on a down note. Makeup and hairstyle can help with your facial features. There are many methods of removing facial and body hair. The best one depends upon both your particular hair situation and how long the hair needs to be removed (i.e. are you full-time or part-time?). Whatever your physique problem area may be, there are cisgender women with the same issue. The Internet has expanded our information in this area, as we can search for “best styles if you have large ________.” In general, remember that darker colors decrease size and lighter colors increase size, and that we want to draw attention away from problem areas, not toward them. What will also help is developing an eye for what cisgender women look like as far as balance between various parts of the body (e.g. shoulders to breasts to hips). Part of the challenge is overcoming the fact that the typical male torso can be approximated by a triangle with the base along the top (the shoulders), while the typical female body can be approximated by a triangle with the base along the bottom (the hips). But you won’t be the first woman who needs to do so. Like voice, fashion sense, posture and walking gait can be learned and improved by observation and practice. Clothing and makeup go hand in hand to some extent, and are somewhat dependent on time of day and event. There are differences between the office and the beach; between a day trip to a grocery store and a night on the town or fancy dress party. To some extent, walk and posture is dependent on both age and footwear. Women walk differently in heels than they do in sneakers. And at least where I live, younger women tend to walk with a more masculine gait than middle aged women. Since gloves have been out of fashion for ages, there is not much you can do about the hands. Longer, pointed nails will elongate the fingers better than a short French cut and will give a little positive enhancement. Darker and/or brighter nail polish will attract more attention to the fingertips. And if your hands are rough, moisturize as often as you can and wear gloves for manual labor. High necklines and chokers can help disguise smaller protrusions of the Adam’s apple, but with larger bumps, they will only focus more attention on them and will be counter-productive unless very loose. For some, surgery will be the most viable option. A plastic surgeon is also an option for those who want to feminize their face and/or increase their bustline to balance larger shoulders and torso. For those who will be taking estrogen, some improvement can be expected in these two areas, with individual results varying. As far as that bulge in a more sensitive spot for those of us who are part-time, non-op or pre-op, there are very many ways to camouflage or smooth that area. It will be the subject of a future article.